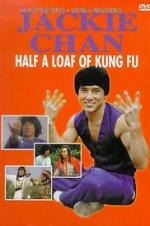 Buy or Rent Half a Loaf of Kung Fu (1978) Movie DVD & BluRay Online! Movie Plot: Mostly a Kung-fu showcase; a loose script describes Jackie Chan’s character learning Kung-fu from a beggar-master and his pupil while guarding a caravan from bandits. Chan’s early comedic beginnings are shown here.